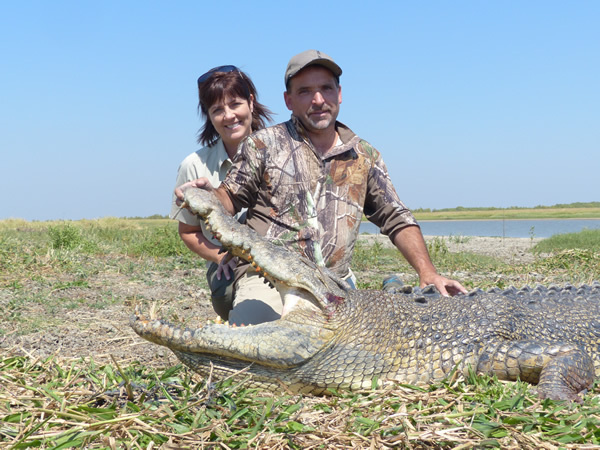 Carmor Plains and Australia Wide Safaris are one of the few safari operators offering Crocodile harvesting. We have a license to catch and shoot saltwater crocodiles for their skins and skulls as trophies. Whilst it is prohibited for our guests to actually shoot the crocs themselves, you can observe us catching them. You can then arrange to purchase the skin or skull from us. Firstly a large croc must be located. This is done by looking for tracks or slides around a waterhole or creek. Partly eaten animals or a pile of bones, normally wallabies and wild pigs (or buffalo if it is a big one!) are always good sign. Then we place the trap in shallow water or on the bank directly by the water. Then an animal carcass (normally a wild pig) is placed in the trap with a rope attached to work as a trip wire. The croc takes the bait, the gate shuts! Bingo!! This can be achieved in no more than 2 days, but we usually suggest 4 or 5. We will not harvest a crocodile smaller than 3 metres (10 feet). We prefer to only harvest the male crocs and this size limit ensures that very few females are actually taken. If a smaller croc is caught it is simply released. This in itself is quite an exciting event as the crocs often turn the tables upon release and the hunter becomes the hunted!